I don’t know about the rest of you, but my Facebook feed is full of grateful people. They are grateful for their children, their spouse, their job. They are immensely grateful for their pets and their parents. And I have quite a few friends who are not afraid to admit they are exceptionally grateful for the wonders of good wine and a good margarita and good margaritas. Personally, I love these “Grateful Project” posts. It’s a great reminder for me. It seems though, that not everyone shares this sentiment. I have seen several conversations on the Interwebs discussing how inauthentic these projects are and that there is something wrong if we need a designated month or prompt to acknowledge the blessings in our lives. In their opinion, we should be grateful every day. Well, duh! Of course we should be grateful every day. The majority of us have fabulous lives with often easily solved problems. However, we are busy with the task of living these mighty lives and kicking like mad to reach the surface when we are swept up in its challenges, and that therefore we consistently forget to stop and recognize how blessed we truly are. So if a little update on Facebook or an Instagram Photo a Day project prompts us to take a moment and truly appreciate what we have, where’s the harm, I ask? 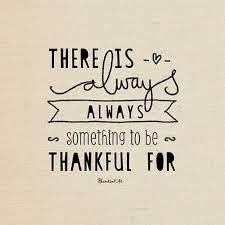 Today, I have a full heart and much to be thankful for. This morning I am especially grateful for two dear friends who, a year ago, said to me, “Why not?” The domino effect of those two simple words has gone far beyond anything I imagined possible. As we sat around the table at our favorite restaurant, they asked about the blog. Simple questions like: Where do you see it going? What’s your ultimate dream? What’s the next step? So I shared my heart. I told them how I’d love to take it beyond my friends and family and grow my audience. I expressed my interest in joining some writing groups so I could learn to be a better writer. I shared the names of some blogging sites I thought about joining. When I was done, they simply said, “Why not?” The list of “why not’s” was quite long. What if my friends are just being nice when they say they like my writing? What if I’m actually a terrible writer? What do I have to offer? What would I really do with it anyway? Again they said, “Why not?” Oh wait, they also threw in a “So what?” So what if it doesn’t go anywhere. So what if you’re not as good as your friends or your mom say? Go for it. Why not? One year later I can proudly say I went for it. And in this year I have met some amazing writers- both professional and those who do it as a hobby like myself. I’ve grown as a writer (well, at least I think I have.) Most importantly, though, I’ve been able to grow my audience and write in different arenas. 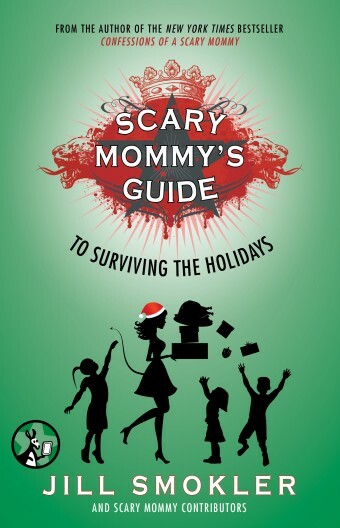 In the last year I have shared my writing on 7 different sites, including some biggies like Scary Mommy. I have become a regular contributor for a small family magazine. And this week I’m proud to announce I am going to be published!! 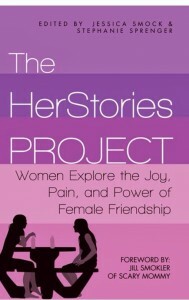 The amazing women at The HerStories Project have put together an anthology and I was one of the selected authors. This project is especially meaningful to me because female friendships and the bond between women and mothers holds a special place in my heart. My years as a wife and mother would not look as they do if it wasn’t for my friends. So to be a contributing author to such a beautiful project is a special blessing for me. And the result of two simple words: Why Not? I encourage you to take a moment and head on over to The HerStories Project site to check out the amazing group of contributors. 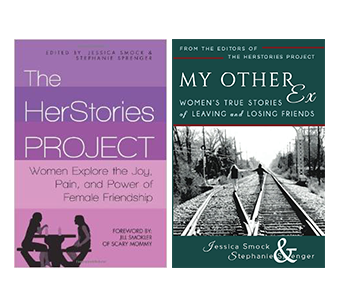 I am truly honored to share pages with these women. If you sign up on the right hand side of their page you will receive updates as to when the book will be released NEXT MONTH! And if you happen to be someone with whom I exchange Christmas gifts… Guess what you’re getting this year!? Just kidding. The next best thing to a full heart on Thanksgiving is a full belly. I wanted to offer you all the opportunity to support a worthy cause. As you know, I think Scary Mommy is brilliant. Her wit and insight always make me take pause and laugh until I pee a little. However, she’s one of he biggies using her powers for good. Her Thanksgiving Project is one of the best ways you can donate your money during the holiday season. As of this morning, she has helped raise $102,537.28 and will feed 1,870 families in need. Any amount will go a long way to help these families who otherwise would not have a Thanksgiving dinner on their table. There are currently 60 families remaining on the wait list. But the best part? Every time that wait list is emptied, she opens it back up to more families in need. Until November 15th that list will be replenished! $50 feeds an entire family, but any donation is accepted and will be matched with another so each family has a full heart, a full table and a full belly on Thanksgiving. Please head on over there and donate if you can. You’ll be glad you did. I hope this holiday season finds you with full hearts and full bellies. And if you need a little prompt to remind you to appreciate all the great things you have in your life…. That’s cool. We all need help remembering things. Just ask my kids. 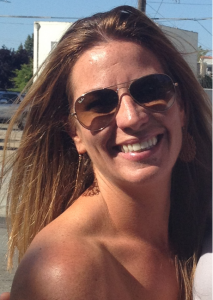 I love your candor and humor and am so happy to have met you. You were one of the first bloggers I found because I could so relate to your stories. I am proud to call you my friend and I wish you every success. You most certainly deserve it! !